Over the last few weekends members of CAGG have been working with members of the West Essex Archaeological Group on a site called Long Shaw near Theydon Bois (pronounced “boys”, as I discovered). The site is a scheduled ancient monument and Ralph Potter, a member of both WEAG and CAGG, obtained the necessary S42 licence and permission from the landowner to work on the site. Typical R-B [Romano-British] material of local quartz-gritted fabric, mortaria fragments, fine orange wares, one rosette-stamped, two fragments of Niedermendig quern. The fieldwalkers created a sketch plan of the site and noted one back-filled machine-cut trench. In February 1977 a letter was sent to the Inspectorate of Ancient Monuments and Historic Buildings recommending that the site, thought to be a Roman villa, should be scheduled. This advice was taken and the site was scheduled effective from the 13th December 1977. Despite the scheduling, the site was again excavated on September 12th 1981 in an attempt to recover definitive evidence as to the identity of the pilot. The scheduling was amended in 1994, but I have no information as to the nature of that amendment. 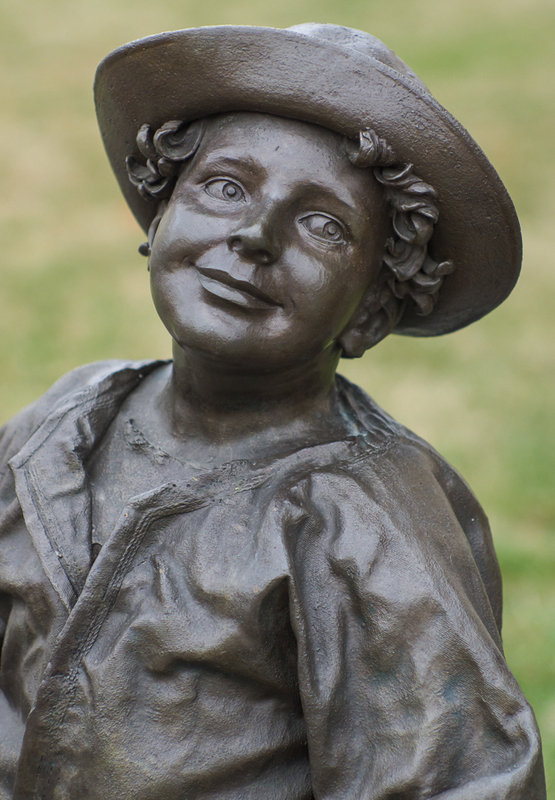 Since then, the site has not been further investigated, until Ralph organised the latest round of fieldwork. The surface of the field is still littered with masses of Roman roof tiles. Roman tiles seen on the surface of the field during the survey. The site lies at the top of a small hill overlooking a valley with quite surprising views for a site in the middle of suburbia. 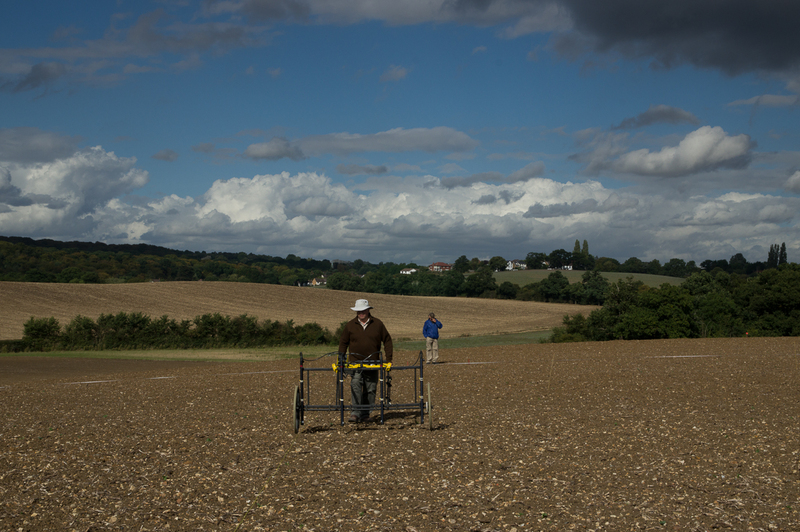 Ralph Potter (WEAG) using the magnetometer aided by Jim West (CVAHS). The other surprise is the occasional Central Line train passing by the site to the east! Luckily we were far enough away for the results not to be affected. On the last Friday of September we started the mag survey and managed seven grid squares during the day. The next day I was delivering the key-note address at a conference in St Albans and left the mag survey to Ruth (WAS), Jim, Peter (WAS) and Ralph. Unfortunately, the weather turned foul, but more worryingly, the mag’s intermittent fault with the odometer reappeared. 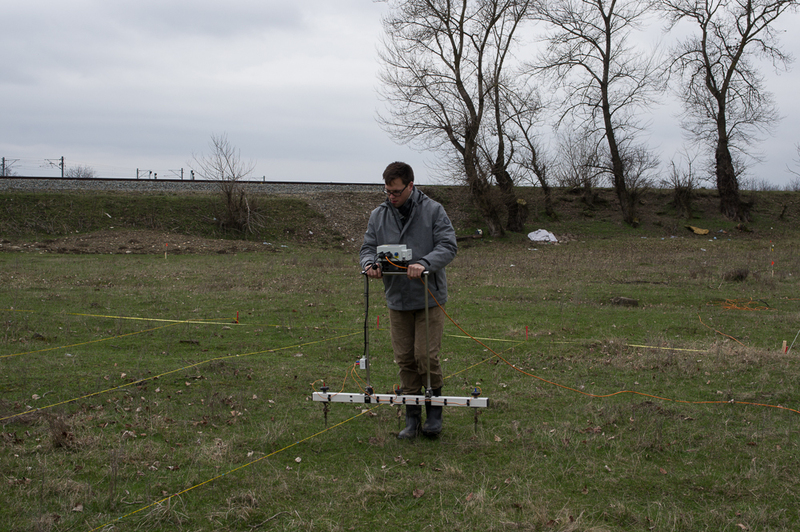 On the Sunday, therefore, we completed six 20x20m grids of Earth Resistance survey. 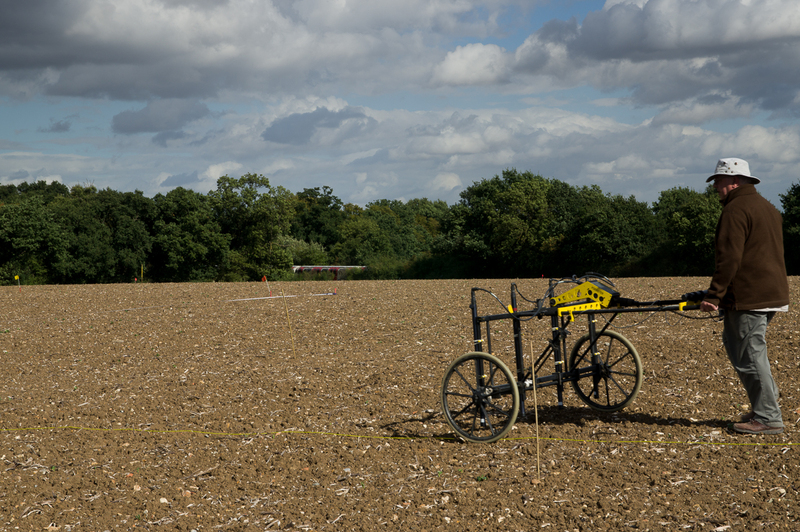 Yesterday, we returned to site with Mike Smith (Wheathampstead History Society) and completed another six resistance grids. Meanwhile, the mag has been sent for repair. The mag survey was not very exciting. 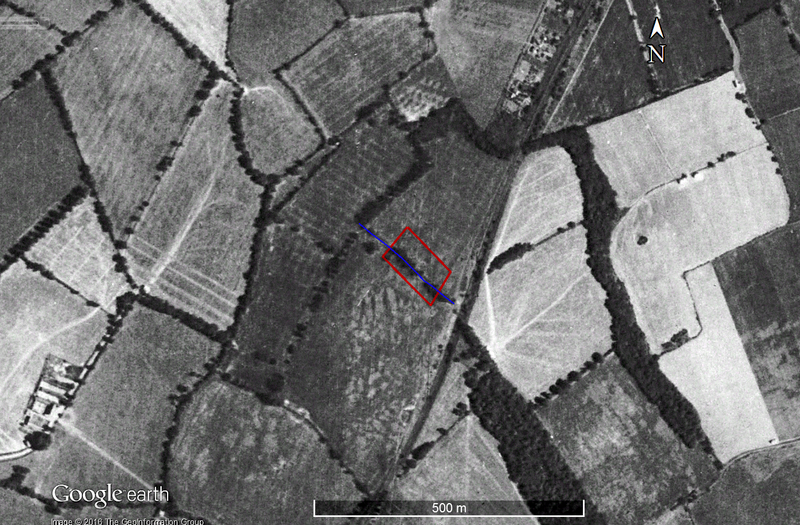 The red line in the image below represents the scheduled monument area. 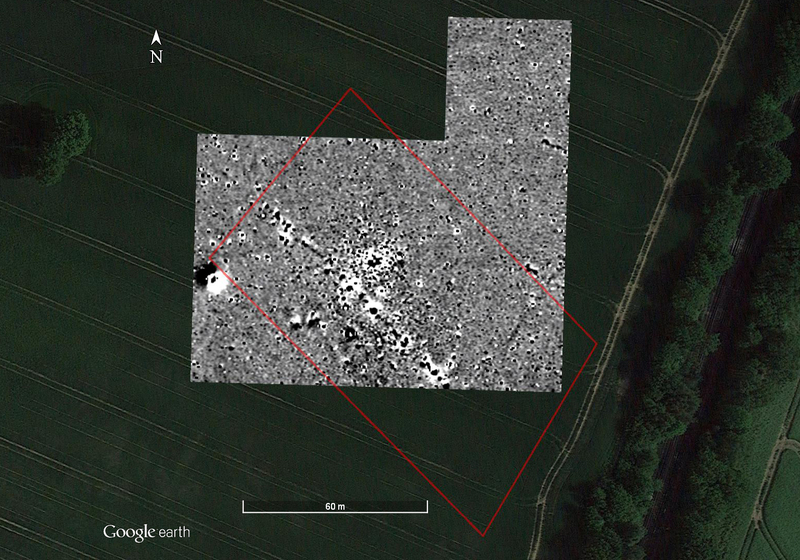 There is a line of ferrous responses which show in this image as strong black and white spots running diagonally across the survey. The explanation for these can be seen by looking at the 1945 historical imagery in Google Earth. The 1945 historical imagery with the scheduled area marked by a red line, and the now-removed fence line marked in blue. There is a hedge with trees running across the field in a similar position. By marking this with a blue line, and then switching back to the standard view with the mag data we can see that they match pretty closely. Mag results with the old hedge line superimposed. 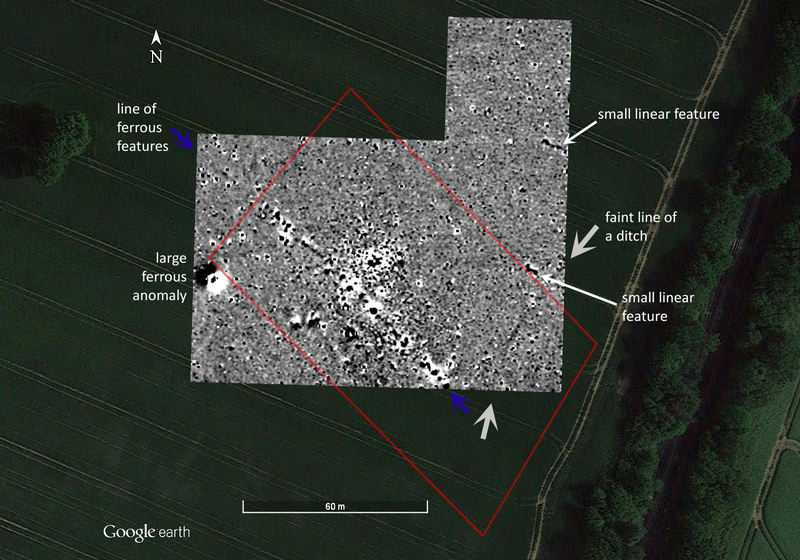 There are, however, a few other anomalies which may be archaeological features which I have marked on the following image. One long linear anomaly (ditch?) and two smaller ones hardly make a villa, but we need to remember that “absence of evidence is not evidence of absence” and it may be that the features simply have no magnetic contrast. 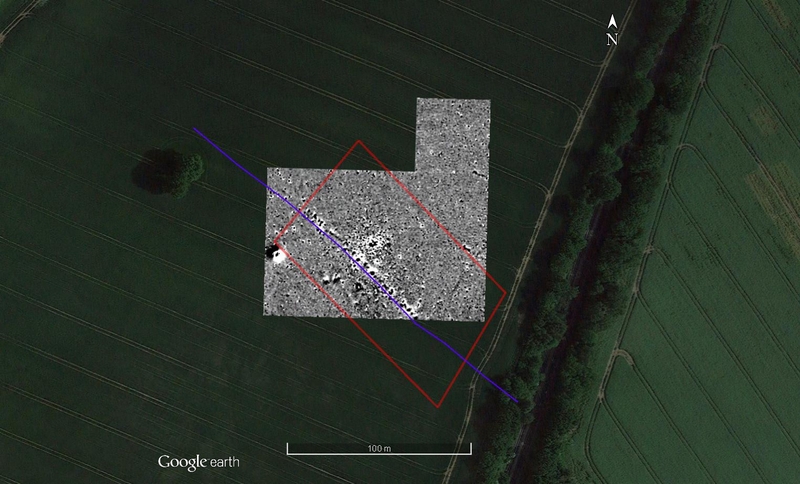 We initially completed an area of 60x40m of earth resistance survey. Although not a great deal showed, there were hints of something on the northern edge and so yesterday we surveyed a further 60x40m. 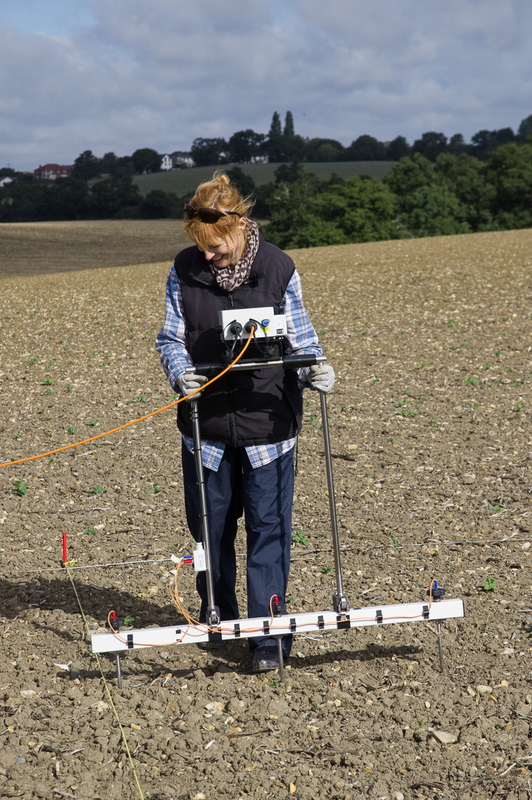 Alexandra Lyons of WEAG uses UCL’s Geoscan RM85 Resistance Meter. We continued to use the pole-pole set-up (i.e., having the remote probes 20m away and with a 10m separation) and this nicely saved us from the pain of matching grids between the two days’ worth of survey. The Earth Resistance survey results. The areas of high resistance, shown in black, are probably largely the result of geology. The lighter, low resistance linear features across them, however, are very curious, especially the one that follows the line of the scheduled area. Was this the trench dug in 1976? Or the 1981 trench which may have aimed to follow the edge of the scheduled area but be outside of it? 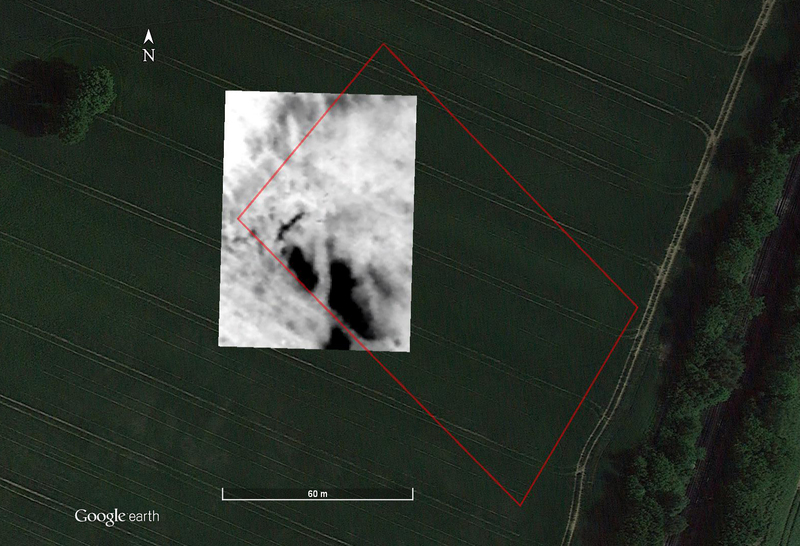 There is one thinner linear feature running SW-NE which might be something archaeological, and it was the bottom part of this that led to the second day’s worth of survey. 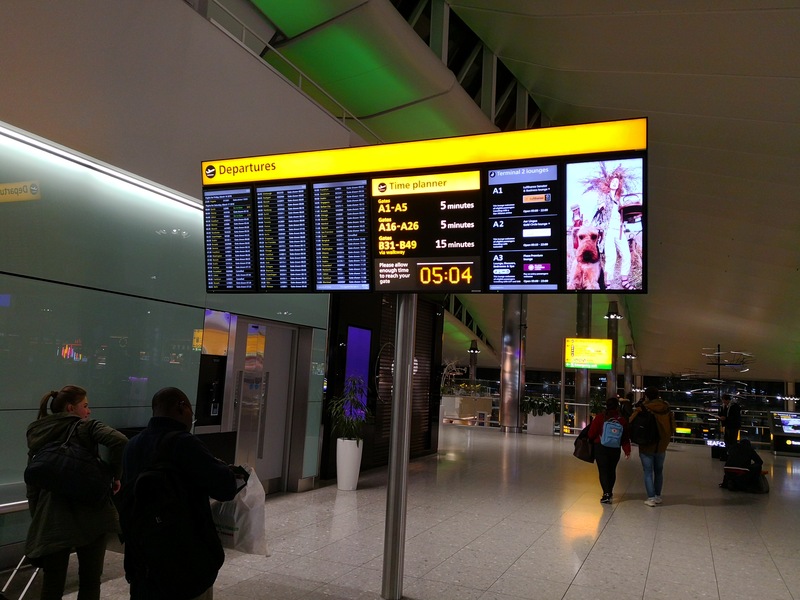 It is, however, a bit irregular and not all that convincing. Here is a composite image showing how the various bits add together. Mag and resistance surveys with the hedge line. Peter Alley has been using his UAV to take high level aerial photographs. Here is one example. 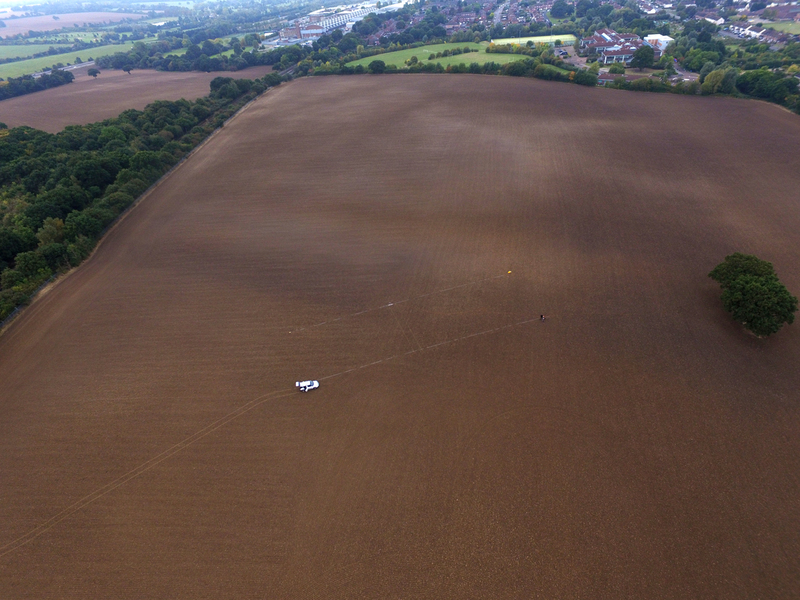 A high level aerial photograph of the site taken using a DJI Phantom quadcopter. (c) Peter Alley. 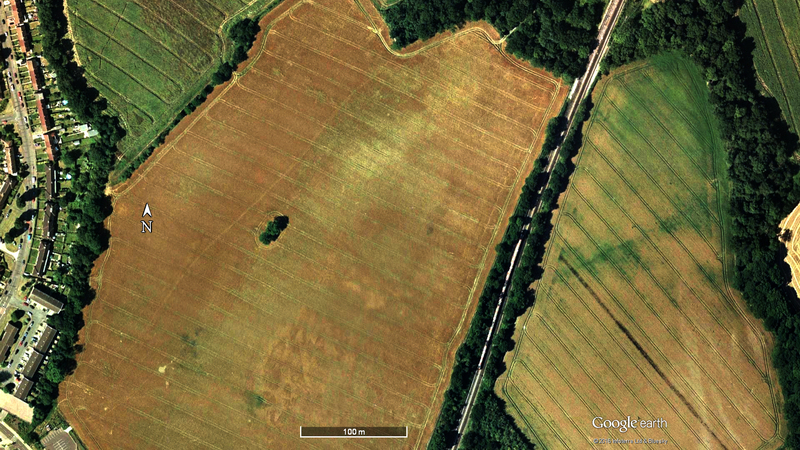 Various soil marks can be seen but nothing convincing as archaeological features. Peter has also been using the images to create contour maps using “Structure from Motion” techniques. 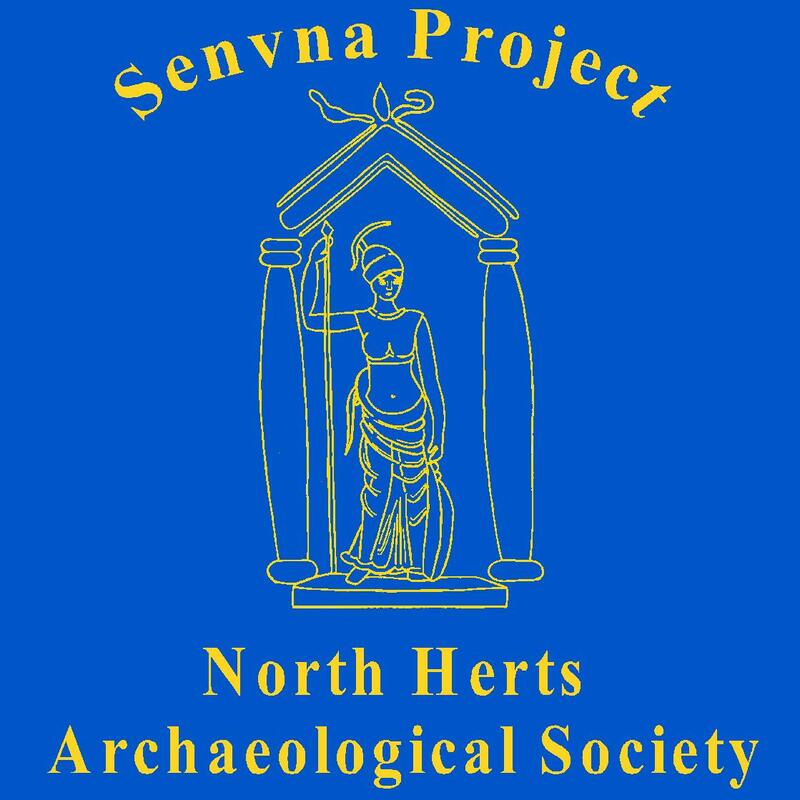 For more on that, come to the Welwyn Archaeological Society’s members evening on the 11th November where Peter will be showing some initial results. Looking at the historical imagery on Google Earth, one can almost convince oneself there is a rectangular feature showing in the 1999 image, especially if one turns up the contrast in Photoshop. The only problem is that the southern edge matches the old hedge line. The 1999 image from Google Earth with the contrast edited in Photoshop. This site remains a bit of a mystery. 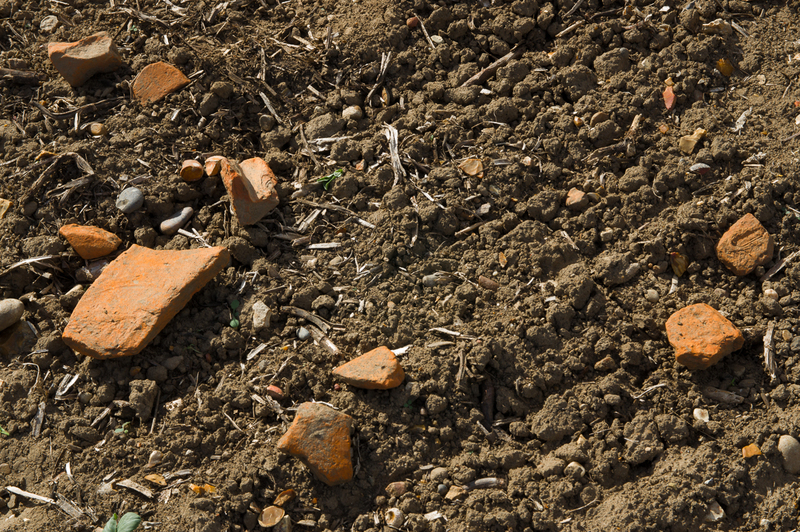 There are large numbers of Roman tile fragments on the surface, but almost no pottery. We only spotted one tiny sherd of Highgate Wood ware and one sherd of LPRIA grog-tempered pottery. 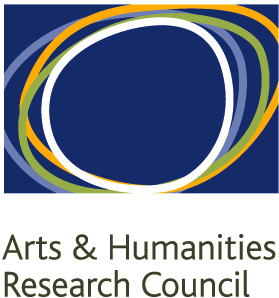 The mag and res results are not very exciting. Ralph’s GPR is equally unexciting although on these clay soils that is less surprising. 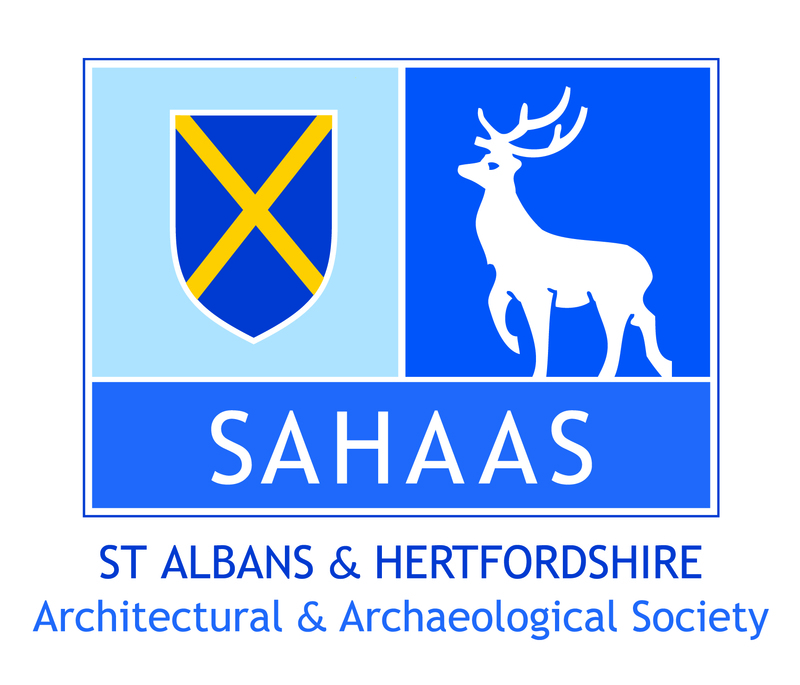 I am torn between extending the surveys in case the actual site lies just outside the area we have completed, and stopping here and concentrating on the many sites where we have had excellent results. It is a shame that the mag is out of action as a minimum it would be useful to complete the scheduled area. Ideally, WEAG should organise a pick-up survey so we could at least map where the finds are coming from. 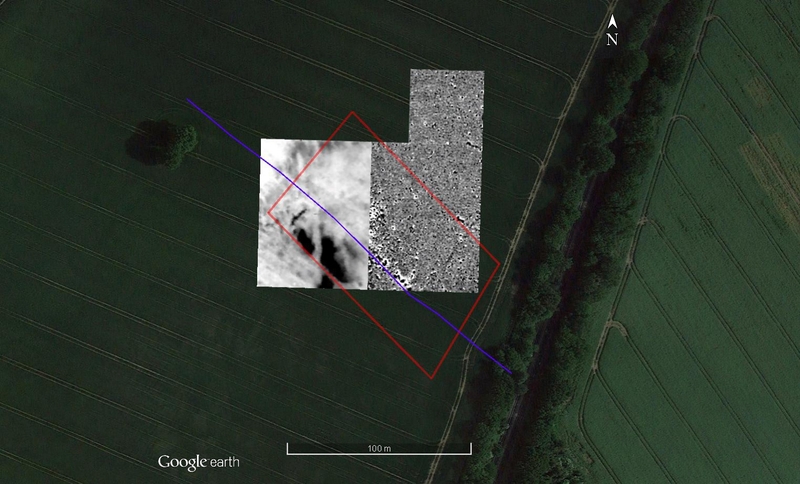 This entry was posted in Long Shaw and tagged crash, DJI Phantom, earth resistance survey, Essex, Hurricane, magnetometry survey, RM85, Roman villa, tile, UAV on October 16, 2016 by hertsgeosurvey.